German Acid + Techno duo, formed 1991. 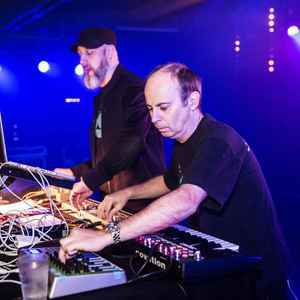 Well known for distinctive Acid sound credited to their virtuoso skill at manipulating Roland TB-303 bass synthesizers. They reputedly use up to six of these machines at once, some of which are highly modified. Hard Floor, Hardfloor (Ramon Zenker & Olivier Bondzio), HRDFLR, HRDFLR. It is difficult to answer the question "What is your favourite artist?". It depends on many things. If I had to answer it, only choose one artist, no matter what style, hiphop, rock, classical, soul... i would choose Hardfloor. Sophisticated, electronic act full of variety, lead by the immortal 303. They are REAL artists. They have done so many excellent tracks like "Acperience 1", "Dubdope", "Into The Nature", "Yimtrop", "Skill Shot" and are famous for their remixing skills, spraying corrosive slime at other tracks. Hardfloor do know how to structure a track. Starting with a 909 adding more and more elements. Nobody creates better breaks than Hardfloor. Having two or even three 303s singing together without any disturbing beats. Rushing to a total climax like in "Depeche Mode - It's No Good (Hardfloor Remix)" Hardfloor do NOT use the TB-303 as a bass synthesizer. They are the chosen! They have the ability to use this silver relic for summoning divine acid creatures that cover all kinds of emotion, elder roaring demons, slimy spawns, mighty forces of doom and desperate and faint cries from the beyond. Hardfloor are without a doubt the pioneers on the Roland TB303. They may not have been the first to use the little silverbox but they're first album TB Resuscitation is thick with wonderful acid trance. Anyone who listened to that album at the time of its release sat up and thought 'What is that stunning noise?'. That album, for me, was when the TB303 was truely born. They're sound has changed over the years but the instruments have remained the same. Quality sound. Quality band. Nuff said.